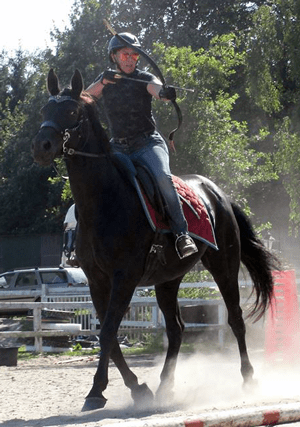 Pia and Danish Warmblood mare Sasse turned out to be natural talents for mounted combat. All photos are copyright © Dina Hjort, Caroline Frandsen, and Lucia Baumann respectively. 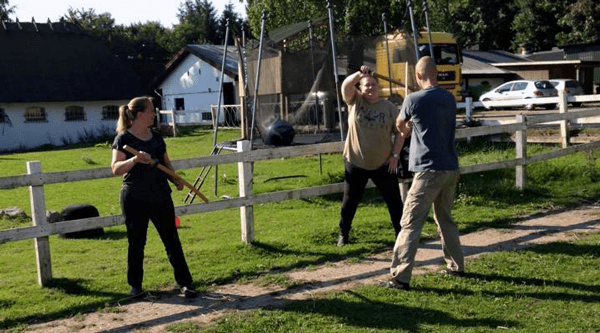 This Saturday I got to live out a childhood dream: Fighting with sword and lance and shooting with bow and arrow at ridecare in Fredericia, Denmark. Unlike in my wildest childhood dreams, I got to do it with real weapons (granted, the swords were wooden replicas) and on horseback! I haven’t had this kind of fun with horses since I was fifteen years old and we Star Wars worshiping fan girls and pony riders fought out mounted duels on the ponies, using our dressage whips as swords (my Arabian made the best Millennium Falcon ever, and he was even white to boot). Adding to the already amazing levels of awesome is that every horse attending was tacked in sidepulls or soft hackamore bridles; mounted combat, as turned out, is all about the booty, and the leg aids. 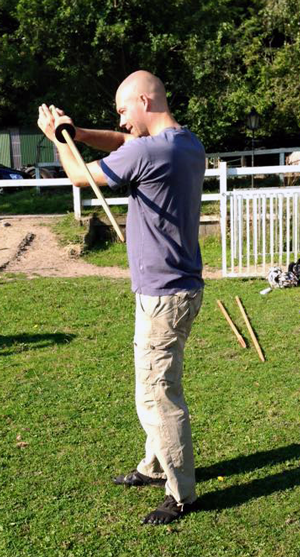 Lars demonstrates how to move with the bokken, or wooden katana. Our instructor for the Mounted Combat workshop was Lars Bossen, a Danish army captain who has spent most of his life studying various ancient combat techniques, including — but far from limited to — mounted combat with medieval weapons. The first step of the workshop did not involve the horses. Before you can even try to coordinate all those limbs and weapons from the saddle, you need to be able to tell them apart on the ground. Lars had brought three genuine metal swords to demonstrate; a Japanese katana, a European broadsword, and a Chinese footman’s sword. However, we students weren’t allowed to play with the sharp toys (this was probably a very wise decision, all things considered). We were issued a bokken, or wooden katana replica, each. The katana being a curved sword it is easier to draw and maneuver with on horseback — the same reason that cavalry sabres are, well, sabres and not straight bladed swords. Chopping the head off your horse in mid-swing is generally not what you’ll be wanting to achieve. Lars walked us through the core principles of how to move with the katana in order to both protect your own vulnerable areas as well as following up with a counter-attack to the unprotected areas of the other guy. It’s both a lot harder and a lot easier than it sounds: The core concept is simple enough (hit him, don’t let him hit you), but once you get into it there are entirely too many legs and feet and arms and heads involved for things to stay simple. The basic fencing steps — block and counter-attack, block and counter-attack. 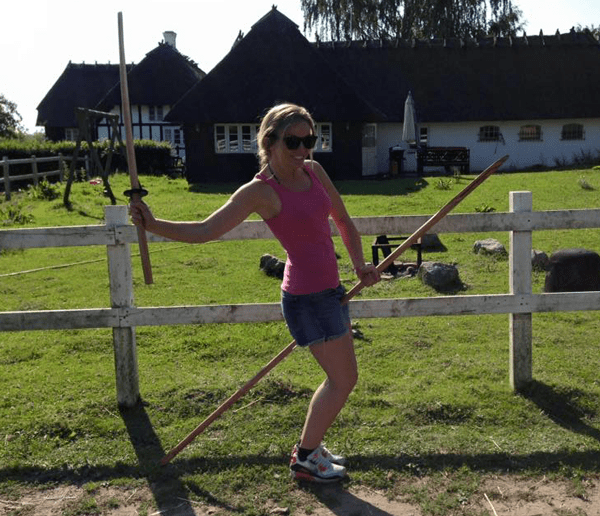 Tine demonstrates the bokken — and the lance stands in for her horse. It’s a good idea not to lop your horse’s head off in mid-swing. We were walked through how to lop off someone’s head (or at least give them a generous concussion) with a downward, angled slash, with katana and lance both. After that, we proceeded to a crash course in shooting a short bow and arrow (complete with how to not peel the skin off your own arm with the bowstring, a lesson only partially mastered by Karin and myself). And then, finally, it was time to get the horses. Mounted and ready, everyone listens for instructions before the action begins. Moving slightly sideways and steering with the legs only while whacking an enemy over the head with a bokken is a lot harder than it sounds. Lars had us do a brief warm-up after which we were given instructions. As a footnote, all the horses were ridden with bitless tack. The trick is to steer almost exclusively with your seat and leg aids. 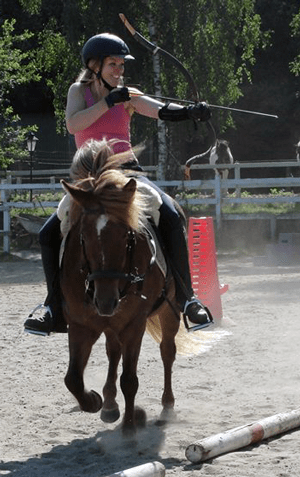 You have the left hand on the reins to assist, but ideally, you should not even need that. Unsurprisingly, those horses who were already familiar with cordeo and/or liberty riding have it easier on this one. My poor Pilar has never tried either and was horrifically confused at first. 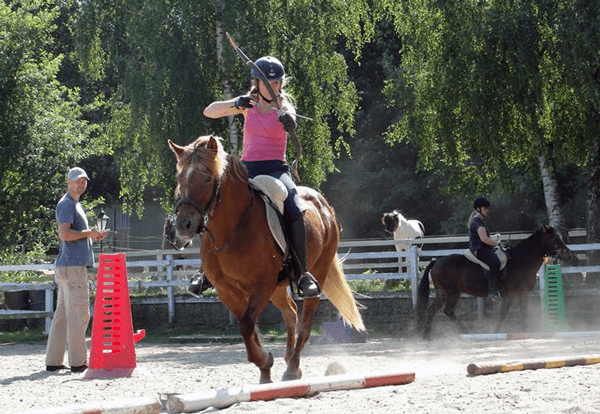 In order to be successful, the horse needs to be steerable with the seat and legs as well as able to do a side pass and turning on its hind axis, preferably without hand aids. 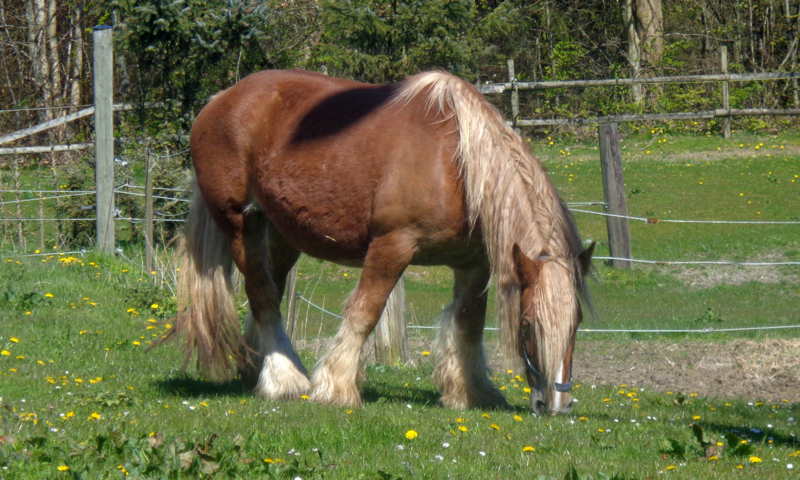 Horses that are trained in Western style probably have it easiest. 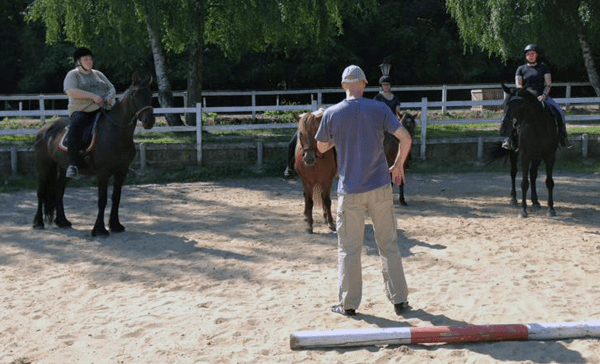 No need to panic, though: Lars helped us teach the horses to do the appropriate moves. Pilar didn’t quite get it all (she’s only three months into riding after all), so we kept our pace at a walk rather than the gallop that is the ultimate goal. No need to frustrate my poor girl, she’ll get better at it as she gets older and more educated. 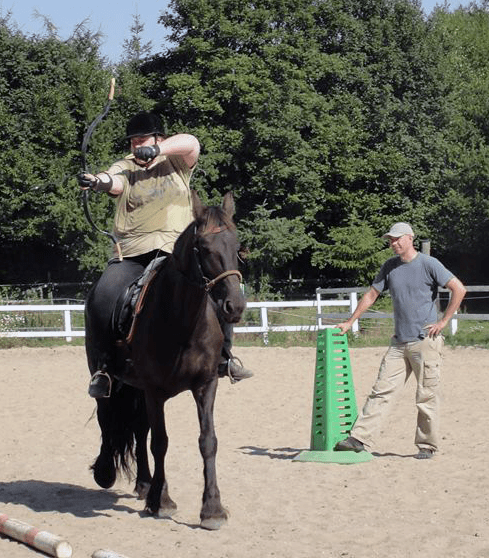 This is yours truly on Friesian mare Pilar, trying to hit the blasted target while Lars Bossen watches. 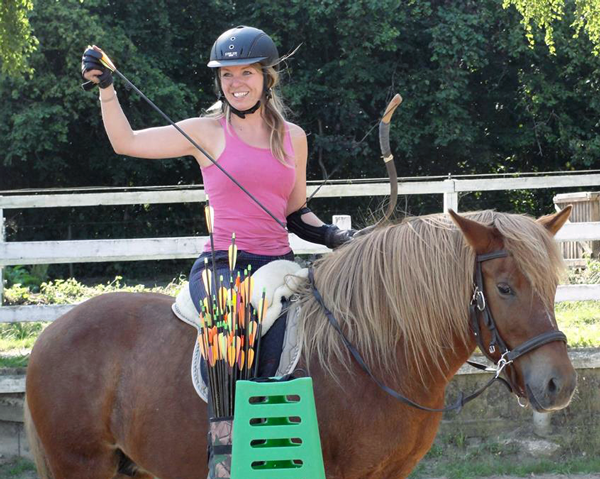 The big finale was, obviously, mounted archery. You think hitting a target is hard? Try hitting it from atop a moving horse! Although, in honesty, while it’s a lot harder than it looks, it’s a lot easier than it sounds. The horses were fairly quick to figure out that they were supposed to move that way, allowing riders to focus on, well, shooting. Dina atop our token black Icelandic stallion, Skyggnir. Four mares and a stallion, not a hint of trouble. He’s as good natured as he’s beautiful. Tine on Thyra did surprisingly well too, given that Thyra has only been seriously under saddle for a fairly short time. The sun was shining, the air on the sand paddock was scalding and dusty. Even so, spirits were high among students and mounts alike. Having a big trough of fresh, cold water for both species no doubt helped. I think I poured as much water into my hair and shirt as I actually drank. I’m happy to recommend this kind of workshop to anyone whose ‘inner Sioux brave’ deserves a day out to play. 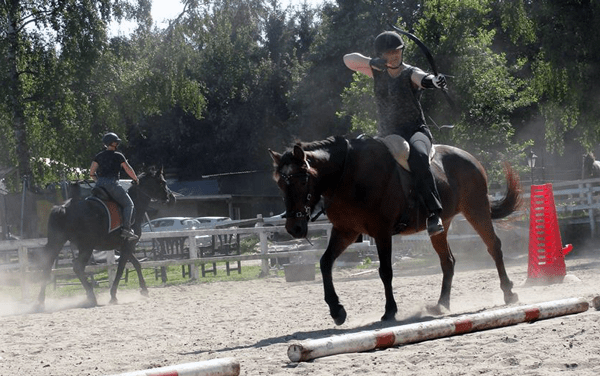 Lars’ Horse Combat workshops are split into three basic levels (Basic, 1, and 2) and two times three advanced levels in combat and horseback archery competition respectively. Basic is what I attended, and one’s expected to have practised for a while before moving on to the next level (in order to get the most out of it). You need to bring a horse and an open mind. 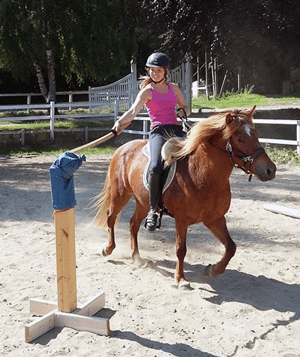 The horse must have the basic skills — it’s typically lack of education in the horse that proves the greatest challenge on the Basic level (ask Pilar about that, she was clearly feeling challenged by so much new stuff in one day). Pia and Sasse turned out to be the natural born warriors of the day, in spite of neither having tried anything like this before. The horses should be calm and used to meeting new challenges. There will be waving of sticks and the sharp ‘thwack!’ of arrows hitting targets, both of which may frighten more sensitive specimens. 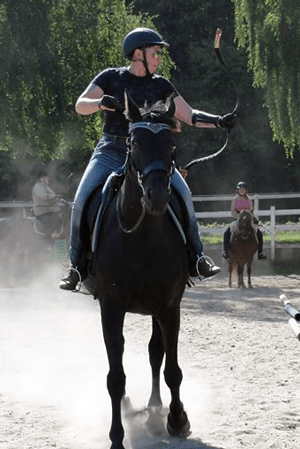 Lars likes to boast that he can take someone who’s never been on a horse or fired a bow, put him or her on a trained horse, and in one day, he or she can hit a stationary target in a gallop. I’m inclined to believe it. Pilar’s struggling with the new concepts held us back the most — the horse is the one that really needs to keep track of its movements and what legs go where. Pilar’s only been under rider for some four months so she is quite excused for being occasionally very clueless — and now we have some solid inspiration for what things we really need to work on together! On a finishing note: Sit back and enjoy gorgeous pictures of horses and riders having fun in the sun! So much focus in such a little horse! Karin on Glitta decided to keep things at a slower pace, as did I. There’s a lot to keep track of! Look at Tine and Thyra and tell me they’re not having fun. That mare’s wearing a grin the width of a barn. That looks like so much FUN! I have serious envy right now!